The ISBU shipment container — L.O.C.C.A. LOCCA has recently purchased an ISBU shipment container and installed it in the back yard of the law office to anchor its artist residency. This new “art pod” will serve as the artist live/work studio for the center. LOCCA is working with other artist run spaces and projects that link to a common ecology of concepts, action and spirit. It is collaborating with Nestor Topchy’s HIVE and Exquisite Corps Container Program to bring the same ideas of sustainability and artist habitation to Houston’s East End. LOCCA looks forward to networking with the many artist-run spaces, individuals, environmentalists and artist visionaries to participate in a “village of ideas” to benefit all of Houston’s residents. 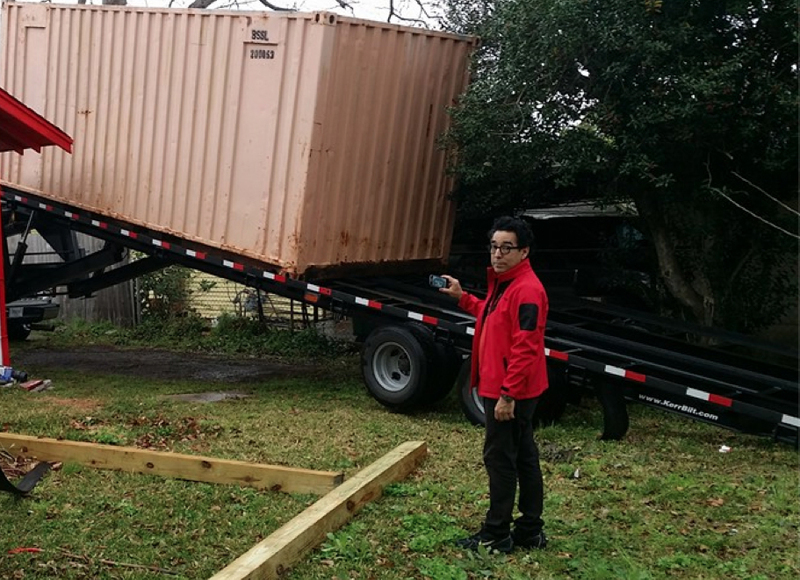 Observing the initial deposit of the shipment container in the backyard of the Sanchez Law Building. The ISBU container from the driveway of the Sanchez Law Building.